Danish-Swedish Farm Dogs Tjalfe and Sigurd (both males)—"Sigurd enjoys the couch and a blanket. Tjalfe is obsessed with balls, sticks, stones, anything he can make you throw. He will do anything to find it and bring it back for you to throw it again. All day. Sigurd was three and Tjalfe was almost three years old when this photo was taken." Note: Tjalfe and Sigurd are Danish-Swedish Farm Dogs, however they do not make the standard as written by the breed club and do not have club papers. 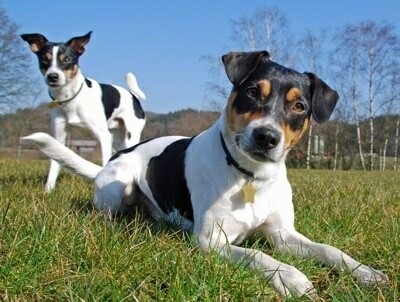 Often mistaken for a Jack Russell or a Fox Terrier, the Danish-Swedish Farm Dog has a shiny, short, hard, close lying smooth coat, which is said to be odor-free. He is small and compact, and almost rectangular in build with a deep, wide chest when fully developed (which takes about 3 years). The head is small, triangular, with a wide, slightly rounded skull and a well emphasized stop that tapers to the end tip of the nose, without the pointy, snipey look. It is the well emphasized stop and the triangular shape of the head that makes it differ from the Fox Terrier. The jaws are powerful. The ears fold forward, or are rose shaped. Tails are either long or naturally bob-tail, never docked. A natural bobtail can occur if one or both of the parents have a bobtail. The natural bobtail can be any length shorter than a full-size tail. Docking is illegal in most European countries. Coat colors include white with chocolate brown and/or black to red / reddish, either tricolor or bicolor. The Danish Swedish Farm Dog is an active, alert, lively and intelligent breed. It loves attention and is sweet and friendly. Curious and full of personality, it is good with children, making a good family dog. Always eager to play. Generally good with other dogs, but not to be trusted with pets such as guinea pigs, hamsters or pet birds. They will point and flush a bird. Fast and agile, they make good rat and mousers, and have an instinct to dig. Easily trained, they learn quickly. Leadership, exercise and training are important and should start while the dog is still a young puppy. They have the ability to learn a wide variety of tricks and are capable of a high level of obedience and different types of dog sports. They have even been used in circus acts. A great herding dog, they will herd a large animal with no fear. Not a yapper, they tend only to bark when necessary, making good watchdogs. Proper canine to dog communication from an owner who displays a natural authority is essential. The Danish Swedish Farm Dog will do OK in an apartment as long as it is sufficiently exercised. It will do best if they have a fenced-in yard, but no matter the size yard you have, you will still need to take him on walks and provide other daily activities. The Danish-Swedish Farmdog requires a lot of exercise. At least one hour a day of some type of one-on-one activity along with a daily walk or jog where the dog is made to heel beside or behind the human holding the lead. Never in front as instinct tells a dog that the leader leads the way, and that leader needs to be the humans. This breed was bred as a working dog, and will do best and be happiest with some type of job to do or some type of one-on-one game with the owner. Keep them leashed in unsafe areas, as they may suddenly decide to chase another small animal such as a rabbit, squirrel or even a cat they see from a distance. The Danish-Swedish Farm Dog is rather easy to groom. The coat is short and does not require daily brushings. Bathe when necessary. This breed sheds a little all year round with a seasonal heavy shedding. Brushing with a rubber brush to remove loose hair can reduce some of the shedding. A very old breed, the history of the Danish-Swedish Farm Dog dates at least back to the 1700s, maybe as far back as a thousand years. This dog was originally called the old Danish Fox Terrier or Scanian Terrier, although today it is regarded a pinscher rather than a terrier. Also, it was often simply called The Rat Dog. It originates in Denmark and Sweden, and is rare inside the USA. A versatile working farm dog that did anything from catch mice and rats, to herd the cattle in to be milked, to a companion dog for the family. It was also popular as a circus dog. Widely used on farms on the countryside of Denmark, Schleswig-Holstein and Scania. As farms were combined to bigger units for large-scale farming and farmers by the thousand became industrial workers, this working dog’s numbers declined drastically until it faced extinction. Up until the late 1980s there was no standard. Practically all medium-sized white/black/maybe brown-colored dogs in the countryside were farm dogs. If someone’s dog was good at catching rats and their neighbor’s dog had an excellent temper, they would let the two dogs mate and have more farm dogs. The Danish and the Swedish Kennel Clubs then made a joint effort to find the remaining dogs, set a written standard and save the old breed from extinction. 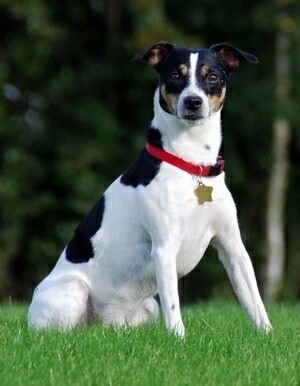 The “new” breed was declared by both kennel clubs and its official name became Danish-Swedish Farm Dog. This was in 1987. Many dogs are not papered with a farm dog club and do not make the standard, but they are still Danish-Swedish Farm Dogs as there is no other name for them. Denmark and Sweden consider the farm dog to be a working breed. However, it is mainly a companion dog in the USA. It is placed in the "FCI Group 2 - working dogs without trials" by the Danish and the Swedish Kennel Clubs. Final FCI approval is pending. NOTE: The Danish-Swedish Farmdog is not to be confused with the Danish Chicken Dog. The Danish-Swedish Farmdog and the Old Danish Chicken Dog are two entirely different breeds. This was mistakenly published in the Bruce Fogle's Encyclopedia of the dog; the Farm Dog was never known as the Chicken Dog. The book has the Danish-Swedish Farmdog listed under the name Old Danish Chicken Dog and has the true Old Danish Chicken Dog named as the Old Danish Pointer. In the Danish world, there is no confusion, the confusion existing only among non-Danish speakers. Websites often make the confusion (including breeders), but it doesn't happen on Danish websites. The reason being that Bruce Fogle's Encyclopedia of the dog is the only English language dog breed book which has the Danish-Swedish Farmdog pictured and described, but has it listed as Danish Chicken dog. This has caused the confusion in the English speaking (and reading) world. Another confusion that exists is in regard to its race. The Farm Dog is sometimes classified as a Terrier, since it looks somewhat like a Fox Terrier, but it is actually in the Pinscher family of dogs. Danish: gaardhund (gårdhund) - Gaard means farm - Hund means dog. Sigurd the male Danish-Swedish Farmdog herding the cattle. Tjalfe the 15-month-old Danish-Swedish Farmdog goes with his owner everywhere. On this occasion on a family visit, he is lying under the windscreen in my mother's Peugeot van.